Do Crickets Chirp Faster in the Dark? A cricket’s chirp is a sound redolent of summer evenings and warm breezes, or perhaps, when one gets trapped inside your house, of long nights and endless frustration. Whether such chirps induce in you nostalgia or annoyance, you are doubtless aware of the fact that they always occur at night. Despite this, crickets do not chirp faster in the dark. Although it may seem like crickets chirp faster in the dark, this actually isn’t true. The misconception may be related to the fact that crickets are active at night, so people assume they “speed up” during that time, when in reality they usually don’t chirp at all during the day. Although their chirp does not relate to amount of light, however, it does relate to temperature: warmer air means a faster chirp. If you count a cricket’s chirps over a 15-second period and then add 37, the answer is usually pretty close to the temperature in degrees Fahrenheit. Crickets are nocturnal, which means they are most active at night and they sleep during the day. During the nighttime hours, they look for food and try to mate, though this is complicated by nocturnal predators such as bats. Luckily, crickets have adapted several methods of dealing with predators. They fall silent when they sense danger is near, and they can use bats’ echolocation to try and avoid them while flying. A cricket’s chirp isn’t just for fun: it’s actually a mating call. Because crickets are nocturnal, they use sound to navigate the nighttime dating scene. When you hear a cricket chirping, it is always a male, calling for a female cricket by rubbing his wings together briskly. Some crickets also create their songs by rubbing a leg against a wing instead. Females fly through the air, navigating to their potential mates and trying to avoid nighttime predators such as bats at the same time. Each species of cricket has a different song, and though they may be indistinguishable to most human ears, some experts have learned to recognize the chirps of specific crickets. The female crickets of each species certainly recognize a potential mate, distinguishing between the different chirps by listening to the type of song and the speed of the chirp. So although night doesn’t make crickets chirp faster, hearing different species may give the impression that crickets are speeding up when in fact multiple types are at work. Where Do Lightning Bugs Go During the Day? 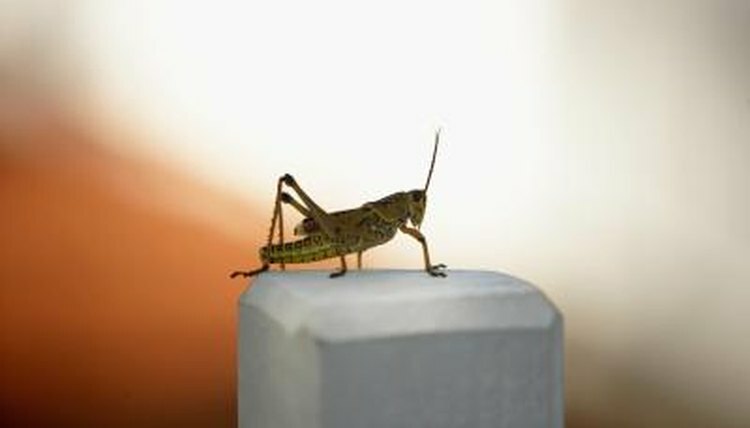 What Affects the Chirps of Crickets? What Type of Smell Do Roaches Emit?